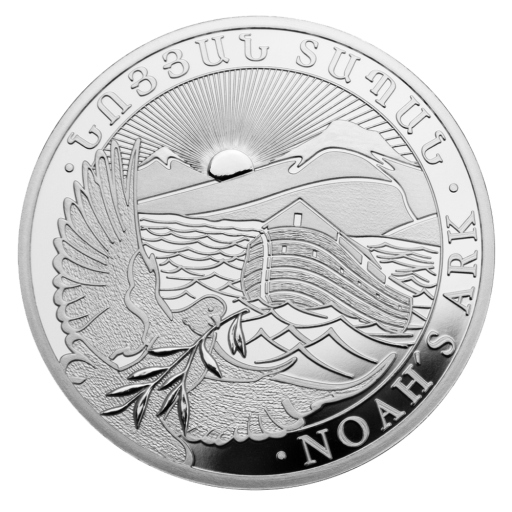 2018 1/2oz Noah's Ark silver coins are minted by LEV Leipzig Precious Metals Factory for the Central Bank of Armenia. The Noah's Ark series is inspired by one of the Bible's most popular tales and has been an unmitigated success since its debut in 2011. 1/2oz coins are an excellent choice for both investors and collectors; they're portable, tradable and affordable, yet you still get the same great design details and a substantial amount of .999 fine silver. Choose the 2018 1/2oz Noah's Ark Silver Coin with coininvest.com for fast, secure delivery. These striking silver coins are a great way to add a unique facet to your collection or boost your investment portfolio with fine .999 silver.